(Photo: World Council of Churches)Rev. Gao Feng, president of the China Christian Council and Rev. 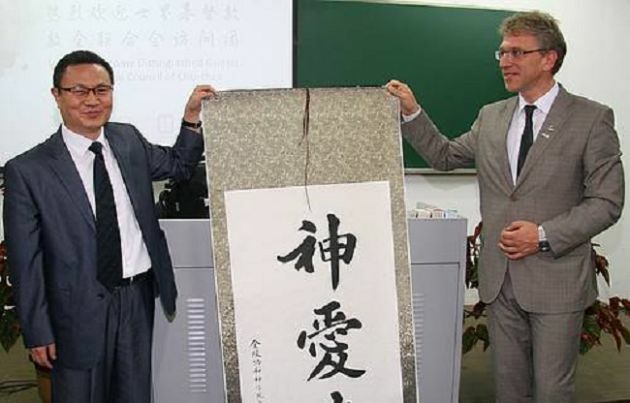 Dr. Olav Fykse Tveit, World Council of Churches general secretary are seen at the Nanjing Theological Seminary on June 14, 2012. The World Council of Churches is calling "especially on rich industrialized countries" to up their support to fulfill the commitment to mobilize $100 billion a year to combat climate change. At meetings in Nanjing and Shanghai, China, from Nov. 17-23, a ley governing body of the WCC, its executive committee, issued a statement on climate justice. Churches in China's State controlled churches are members of the WCC. Christianity is growing rapidly in China, but the government frequently faces criticism for hostile actions against 'house' churches not offically approved, or even sometimes against the Roman Catholic Church. Its call, from China, came as the world's biggest economy, the United States, is preparing for a new administration under President-elect Donald Trump. The next U.S. president once referred to climate change as a hoax devised by China to secure an unfair trade advantage. A U.S. withdrawal from the Paris climate change agreement is unlikely to scuttle the international deal, but it could instead see China take on a leadership role, CBC News quoted experts as saying Nov. 23. In its statement, issued Nov. 25, the WCC reiterated the urgent concerns of churches in relation to climate change, and called on all States to fulfill the commitments of the United Nations, Paris Agreement. The Paris agreement, adopted at the U.N. Climate Change Conference in Paris in Dec. 2015, came into legal effect after a rapid ratification process in which both China and the United States of America joined. The Paris Agreement commits countries to keeping the global temperature rise to below 2° Celsius, making every effort to limit the rise to the lower threshold of 1.5°. The WCC groups more than 520 million Christians from mainly Anglican, Orthodox and Protestant traditions and works close with the Roman Catholic Church which serves on some of its bodies. The WCC welcomed the example offered by the government of China in its ratification of the Paris Agreement, and "in leading the world in investing in development of renewable energy." The statement encourages the government of China to "show further global leadership by reducing greenhouse gas emissions in line with the Paris Agreement commitments." The statement also reaffirms the importance of continuing ecumenical action for climate justice and intensified interfaith cooperation for the implementation of the Paris Agreement. The WCC executive committee "calls especially on rich industrialized countries to scale up support (including through technology transfer) and to fulfill the commitment to mobilize $100 billion per year for climate change mitigation and adaptation from 2020." The statement also expresses concern at a pledge by Trump to withdraw from the Paris Agreement, and calls on the U.S. government to maintain and fulfil the commitments entailed in its ratification of the Paris Agreement. It notes that climate change is already having adverse consequences on the very foundations of peoples' sustenance, water and food. The WCC statement encourages the work of the WCC's Ecumenical Water Network and of the WCC-Ecumenical Advocacy Alliance Food for Life campaign. The WCC Executive Committee meet twice a year, while monitoring the council's ongoing work, approving plans and superviseing the budget approved by the council's main governing body, its central committee. The meeting took place in Shanghai and Nanjing and was hosted by the China Christian Council and the Three Self Patriotic Movement Committee. WCC leaders met Nov. 24 November with Minister Wang Zuoan, Director of China's State Administration for Religious Affairs, in Beijing.